Our Alternative London tours and workshops are perfect for educational organisations looking for something fun, engaging and interesting for students of all ages. We have organised bespoke activities for hundreds of schools, colleges and universities from all four corners of the globe. 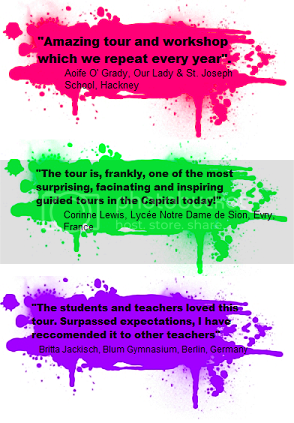 Either as a unique insight into East London on a visit to the capital or a street art tour or graffiti workshop to tie in with studies, such as the the Key Stage 2 Art & Design Curriculum, we've got it covered! Multi award winning, reputable tour company that has been in Trip Advisor's top five London activities for over two years and featured in Guardian Travel's top 10 guided tours in the world.